There is not enough evidence to support the effectiveness of immunising older people against flu, fresh research in the US has concluded. Researchers from George Washington University, Washington DC, say the benefits in reducing deaths among over 70s have been "greatly exaggerated". The findings echo a controversial 2006 British Medical Journal study. But the latest study, in The Lancet Infectious Diseases, nonetheless urges vaccination to continue for the moment. Most rich countries recommend vaccinating the old and the weak against flu annually in time for the winter. As well as preventing flu, it is also thought to prevent deaths from other underlying chronic conditions. In many studies, flu-related deaths are considered to be all those above the expected winter baseline. This is known as winter excess mortality. Researchers from George Washington University, led by Dr Lone Simonson, say that in the US - despite an increase in vaccination coverage from 15% to 65% since 1980 - excess mortality among elderly people actually increased during the 1980s and 1990s. They also cited an Italian study, which found no decline in flu-related mortality rates, even as vaccine coverage rose from 5% to 65%. The study also deplored what it saw as a lack of placebo-controlled randomised clinical trials (RCTs) among those over the age of 70. They accepted that such trials were, however, unlikely as they would involve denying some participants access to a treatment which it is recommended they receive, and as such would not pass ethical review. As an alternative, the team recommended that future studies should use "more specific endpoints" than just overall winter deaths. This should include "vaccine effectiveness against the highly-specific outcome of laboratory-confirmed influenza virus, which although labour intensive and expensive, is more likely to obtain more realistic estimates of vaccine efficacy". But despite its reservations about the quality of the available evidence, the team nonetheless recommended that people over the age of 70 should continue to be vaccinated until better data could be collected. Dr Tom Jefferson, of the Cochrane Library - a body that determines the relative effectiveness of health interventions - welcomed the study, which repeated many of his own assertions made in a paper published a year ago. Writing in an editorial, he said it was time to carry out a placebo-based trial in which some participants are denied the jab. "Head-to-head comparisons with other types of influenza vaccine will not allow direct assessment of absolute vaccine effectiveness," he wrote. "Could governments be courageous and honest enough to reassess their cherished policies?" 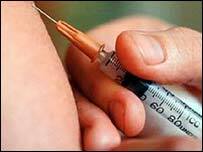 It costs about £115m to vaccine the vulnerable against flu in the UK each year. "The aim of our influenza policy is to protect those who are most at risk of serious illness or death should they develop influenza," a spokesperson for the Department of Health said. "UK policy is constantly under review to take into consideration all available evidence. This study acknowledges that, whilst waiting for an improved evidence base, vaccination with flu vaccine in this group should continue." The Royal College of GPs said it endorsed current policy and suggested that the study was lacking. "There is a widely-held view that many respiratory virus infections cause mild, self-limiting disease and this is true," it said in a statement. "But it is equally true that the relatively infrequent serious outcomes from this apparently minor illness add up to a major public health problem. "Routine annual influenza vaccination of the elderly and persons with co-morbidity remains a vital element in this attack."